All I did for this study was get a piece of paper and a pencil and start a new game. 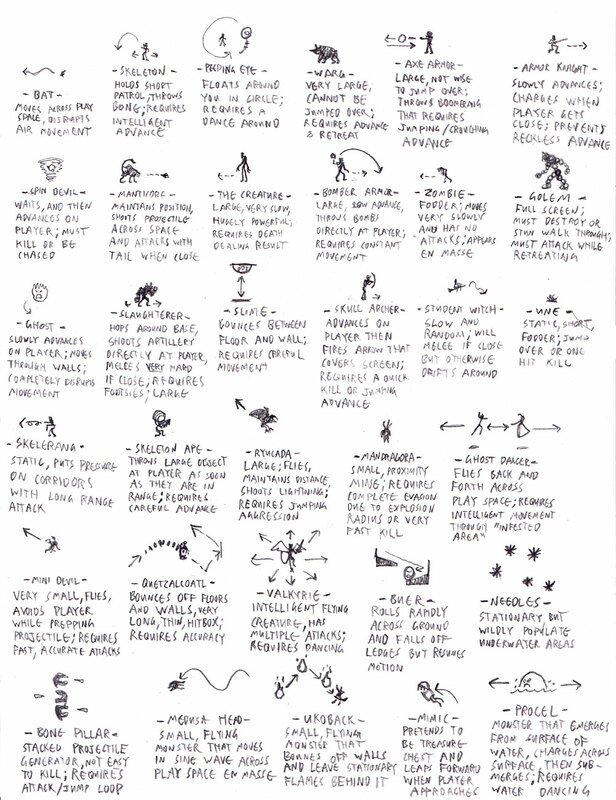 The rule was that whenever I encountered a new enemy, I had to take a couple very quick notes on their movement pattern, remarkable properties, attacks (if any), and most importantly, their REQUIREMENT. What I mean by "requirement" is the player behavior required to move past or kill the enemy. I wanted to start developing a specific library of meaningful hurdles to draw from. Castlevania games throw hundreds of different types of enemies at you! And while they all have very straightforward behaviors, dealing with them is oftentimes not at all straightforward. It's one of the many incredible things about these airtight action games, and it seemed like a good place to start taking notes. Anyway, here are the notes (click on the image to zoom in). Obviously this doesn't even scratch the surface of the gold mine this game has buried inside of it in terms of meaningful hurdles, but even in this sampling of very early enemies there is incredible creativity and challenge. I realize this is terribly abstracted, and I realize beautiful essays could be written on individual enemies. But this is just a springboard, and in the next post I'm going to share a much more intricate dissection of Devil May Cry 4's UH-MAZING cast of enemies, which are much fewer in number but more individually nuanced. If you want to talk about any of these enemies, just bounce on into the comments there and I'll rap with you. SORRY ABOUT THE CHICKEN SCRATCH. Really looking forward to seeing where this is going! I never saw the combat merit in these games. They are grindable, and easy: you have a huge healthbar and frequent save points. You don’t have to vary how you deal with enemies too much because you can take those hits and as you get more powerful can mow through enemies effortlessly. Even against enemies above your level I remember it as mostly jumping attacks and backing off where appropriate. You don’t have to pay too much attention to that stuff to survive, unlike Classicvania where it is all positioning and dodging. When you look at the patterns out of the game, though, I can see the variety, and when you analyse them like that I can see ways some of them, used properly and in another game, could be a very interesting challenge. “The sine wave is a function of such enormous mathematical depth and beauty that you could spend a meaningful lifetime studying it”. Almost every line is dumb. I’m also looking forward to what you do with this stuff. I don’t disagree that DoS is not particularly challenging at the end of the day, especially if you understand the system and how to produce and maintain synergy between weapons and souls (and if you know how to utilize jump/land/dash cancelling to fire off multiple attacks very quickly). But that’s actually why I enjoy DoS; there is a lot of variety on every level and ultimately it’s an exercise in mechanic exploration. I spend more time having fun with soul combinations then I do making my way to the next advancement point. I think that essay is beautiful because I find obsession beautiful. All I meant by “abstracted” was that there’s a lot more nuance in each of the examples I jotted down, but I simplified and distilled for brevity, and to ensure a bird’s eye view at the end of the study. I’m looking forward to it, too! Haha! Our enemies as is are aggressive, distinct, and punitive, but they have NO control over an aggressive player. Since I built this combat engine on fast paced aggression, mid to high level players clean house. So it’s time to level up but I don’t know exactly how it will go down. I’m excited! Long time fan of this blog and really looking forward to more dissections like this (DMC4, whoo!). Been doing similar research for the sake of my own game so it’s nice to be able to compare notes so-to-speak. Keep up the great work!! Hey thanks a lot, bud! honestly, I think you should be examining Castlevania 3 or Castlevania Order of Ecclesia if any of the Castlevania games. Symphony of the Night was a revolutionary Castlevania title, but it really undermined a lot of the level design dynamic that classic Castlevania games had running, and I feel only Order of Ecclesia really came close to reclaiming that with its enemy placement and use of more dynamic enemies in general that actually functioned as roadblocks that had to be negotiated in order to progress. The majority of situations in other post-sotn Castlevanias don’t really actively challenge the player or block progression. The key in design for a good Castlevania enemy is that avoiding an encounter with it is as dangerous as actively attempting to fight it (it is a good roadblock), it actively threatens passive players (Good chasing or attack patterns), and it is difficult to kill. I feel like this style of design was common in classic Castlevania games, but short of order of ecclesia, it has fallen flat in more recent Castlevanias, which were stronger in other, less important, areas. Study of the Castlevania enemies makes sense, as Castlevania does represent a very wide and diverse design space, ripe with potential for ripping off in other 2d action titles (imagine a guy who shot medusa heads from afar, that would be hell), but you’ve gotta remember that the devil’s in the details, the idea for the pattern might be good, but Castlevania itself does not take as much advantage of these patterns as it could be. If you want to really make use of it, you will have to do better than your source material here. The Games that incorporates this in an amazing way, are the Lament of innocence and Cures Of Darkness games. the Enemy design in said games is amazing. With just some tweaks the enemies would be perfect for a Beat-em-up in the style of Bayonetta and Devil may Cry.